If you plan to make multiple tabletops, it will help save time in the future if you make a template and work from that. Working without a template is possible – just mark a center point on the flat sheet of 3/4″ melamine-coated particle board that will be the casting surface. 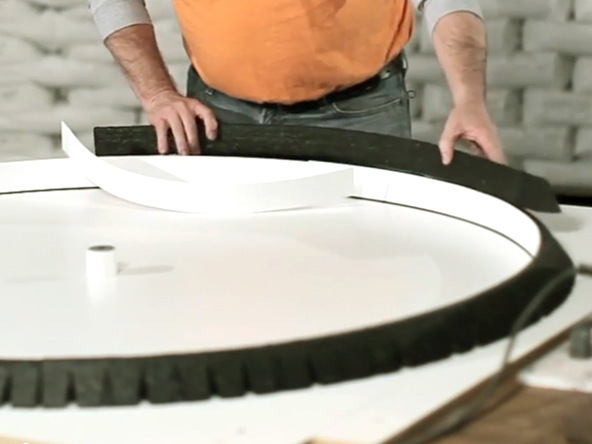 Use a large compass, or a pencil and string, to mark out the diameter of the tabletop. 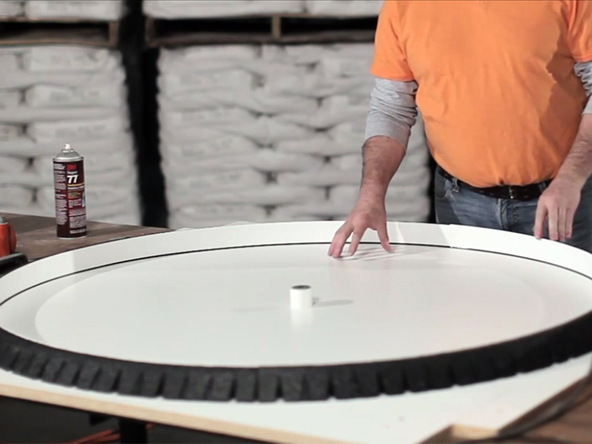 The tabletop shown here is 48″ in diameter and 2″ thick. CHENG Curved Wall Sections make forming up curved shapes very easy. 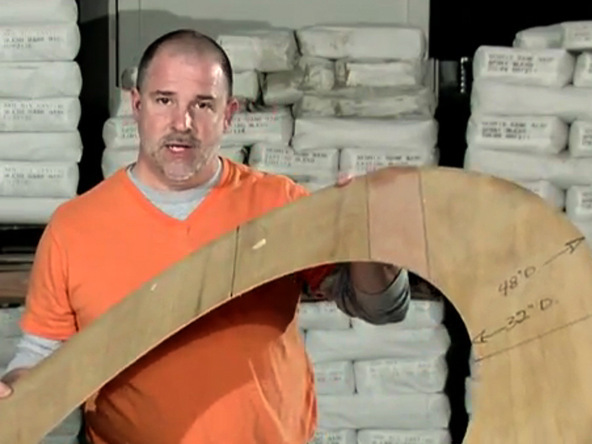 Use spray adhesive or double-sided carpet tape to adhere them to the casting surface, following the line of the curve. 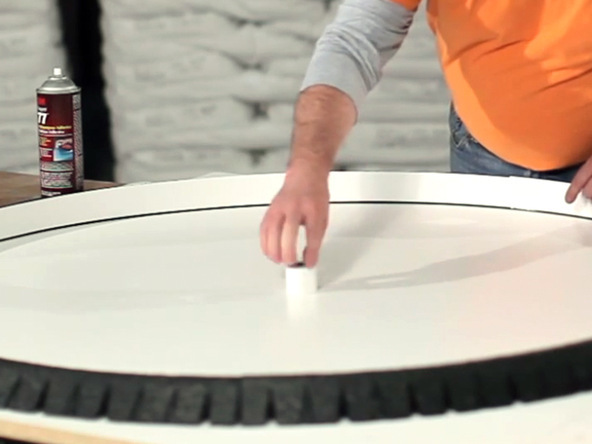 Trim the end of the foam wall section off and complete the circle. A tighter bend might need to be fixed to the casting surface with a few drywall screws to keep it from moving – sometimes the tape or adhesive just won’t do it. 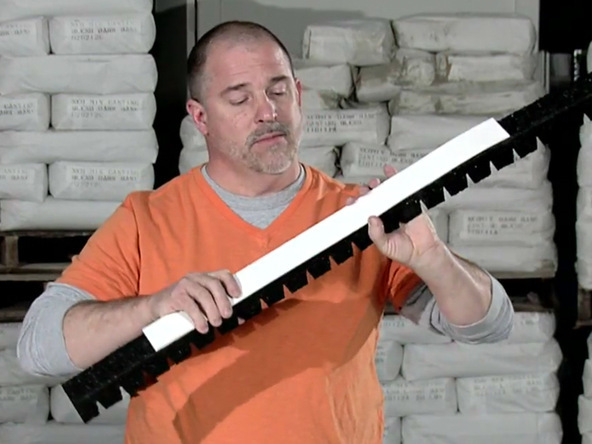 With the outer walls in place, attach the Wall Liners using transfer tape, spray adhesive, or double-sided carpet tape. This will provide a clean edge on the perimeter of the table top. A central knockout is used to create a hole for an umbrella pole. This knockout is created from a section of PVC pipe wrapped in foam and covered with clear packing tape. The foam will help it release easily from the concrete, and the tape will leave a smooth surface. The knockout is screwed down into the form with a long drywall screw and a big fender washer. The form is now ready to caulk. Check out the Corner and Seam Shaping Tools Guide for more tips on sealing the form. 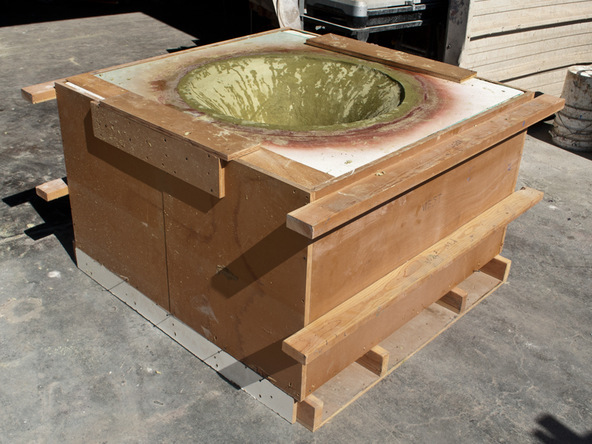 After any Decorative Details have been added, the form is ready for casting. Glass fiber scrim and fiber reinforced concrete backer mix is used to “stitch” the two halves of the table base form while the concrete is still pliable. 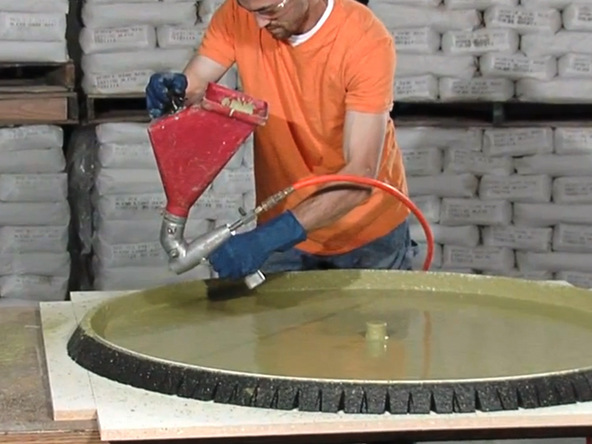 A flowable fiber reinforced concrete mix is initially sprayed into the form before a stiffer backing mix is placed as structural reinforcement.